The unique design of Metal Caged Fisherman string light is striking and adapts to any decor. For example, a mirror in the bedroom or decor in the living area with warm white light string. Enjoy the warm white glow and the pretty pattern that the fairy lights exudes in the on-state. Your decorative and gift ideas are no limits with this LED Metal Caged Fisherman Light chain. 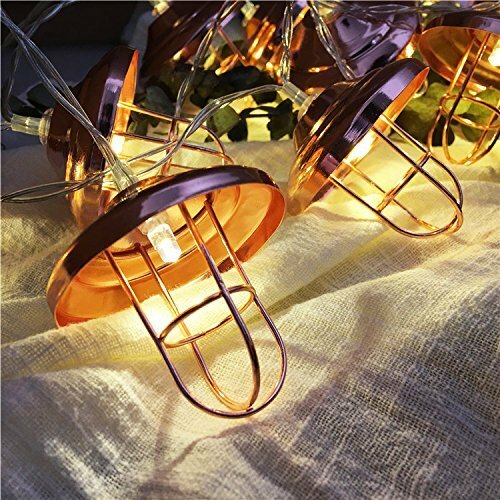 You will receive a 10 LED String Lights in warm white with Metal Caged Fisherman . The light string has a total length of 9.84ft. The battery power of light string is made by 3 X AA batteries, these are not included in the scope of delivery. This is not a fully waterproof one, to maintain the long life span, you shall keep it from rain or damp environment. The battery box is not waterproof, please keep it away from the damp place.